Ambitious. Webster defines it as “having a desire to be successful, powerful, or famous; having a desire to achieve a particular goal; aspiring.” These are words that best describe Taylor Goering of McPherson, Kan. The 19-year-old is a sophomore at Hutchinson Community College in Kansas. She also manages a boutique three days out of the week, cares for a string of at least half-a-dozen show heifers, helps her parents on their farm and is a BioZyme® dealer. Taylor has been showing cattle for about 12 years. She shows multiple breeds, and likes to lead anything into the ring, “as long as it’s a good one.” Although, Simmentals are her favorite. She gives her parents Greg and Tammy a lot of credit and appreciation for their support in her show career and her start as a BioZyme dealer. “My dad always said, ‘I like to get you in the ring as many times as possible.’ Without his support I wouldn’t be where I am today,” Taylor said. And it was at one of the many junior nationals that the Goering family attends each summer where mom Tammy first learned about Sure Champ®. Tammy was looking through the trade show and came back with Sure Champ information and suggested the family might want to investigate it. The father-daughter duo were busy with cattle. Taylor said her mom went back and bought a bag of Sure Champ, and they have been hooked ever since. “We noticed a difference in our cattle’s hair coat and appetite right away,” Taylor said. They began their on-farm dealership in 2012. 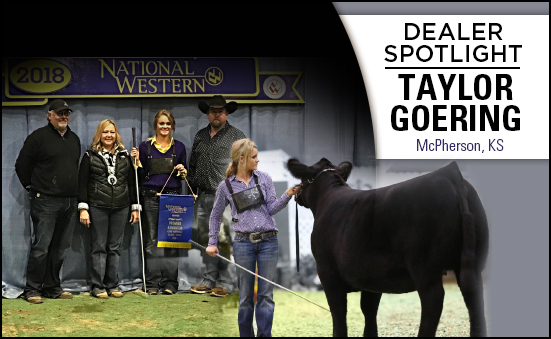 Taylor has made a personal connection with many of her customers because she is also a cow-calf producer and has traveled the U.S. going to shows and understands what her customers are looking for in a supplement. “I can relate to a lot of my customers because we are all looking for success in our herds – either the benefits from relieving stress from show calves traveling or increasing fertility/conception rates in their herds. The best part of the products are the results. You can see the results. I really like the personal testimonies because every person has a different product they believe in,” she said. Although the dealership started as a family affair, Taylor has taken on most of the responsibility since her parents are busy with other endeavors. Much of her customer base has been built from word-of-mouth, and people continue to call and ask about products. Taylor said the best part of being a young dealer is the satisfaction of succeeding at such a young age and getting a head start on her future. Goerings reached VIP Status in 2015, and Taylor said it is her goal to reach that milestone again in the future. “Dreams don’t work unless you do,” is her motto. “It’s not scary at all. I love being as young as I am, and having goals set for me within this company. It is rewarding to become a dealer because if you have a question, someone is always there to answer. You might wonder, will anyone buy from me? But our biggest response to the product has been word-of-mouth. People will drive by our pasture, and see the orange tubs, and want to know where we get those from,” she said. She added that as a younger person who recently “aged out” of 4-H, it is important to her to give back to the local youth programs. She said she will sponsor awards or shows that help benefit local youth with livestock projects. This is also another great way to share the BioZyme message. Ultimately, Taylor would like to earn her bachelor’s degree in General Business, expand her dealership to a store front, and achieve the VIP Dealer Status again. Those might seem to be lofty goals to most 19-year-olds. But with the ambition that Taylor has, she knows how to convert goals into accomplishments.